We offer gas detection & suppression system & wide range of fire alarm system, fire hydrant & sprinkler system and velocity hydro spray systems. Supported by the love of the clients and our commitment to the theme of the customer contentment, we are involved in the trade, retail and service provider of Gas Suppression System to the clients. Some of the notable points of attraction of these gas suppression systems are easy to install nature, excellent operation and high quality. These gas suppression systems require least amount of maintenance and are available in large quantities with us. We provide a wide range of Industrial Gas Detection System, which is catering to the requirements of diverse industrial, commercial as well as residential applications. Our range of gas detection & suppression systems is easy to carry and can be installed without any major effort. These are easier to use and require minimum maintenance that make them more popular among users and distinguish us in the competitive market. 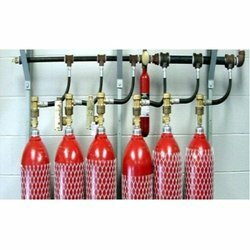 Fire Protection Gas Suppression System or simply called as Automatic Fire Suppression System (or Gas Suppression System), is relatively a new technology in India. Unlike conventional system that use water, in Gas Based Fire Suppression System; water is never used and yet the fire is extinguished. Here Gas is used to extinguish the fire. Hence it is a Gas Based system. The fire gets extinguished, within a minute of activation and everything is automatic. 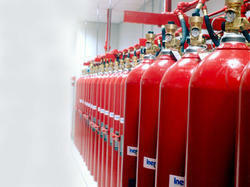 Is it always necessary to provide Fire Protection with Gas Suppression System? Or Why go for a Gas Suppression System? Absolutely not. In certain areas like Server Systems, Art Galleries or near delicate machinery, water can cause more and permanent damage than the fire. In the Server Room, the data in the server is more costly than the server itself. If the art piece or data, gets damaged or lost; it would result in an immeasurable loss. How do Gas Suppression System Function? Gas Suppression Systems are generally used in concealed rooms. The principle used by Gas Suppression System is by breaking the Fire Triangle, the fire ceases to exist. In the room, protected by Gas Suppression System, there are various detectors placed at various locations. Each detector constantly monitors the room for signs of fire. As soon as fire is detected, an alarm is sounded, to the personnel to evacuate the entire room. Then, the a gas like, Novec, Clean Agent or Co2 is released in the enclosed room. Thus, the oxygen in the room is rapidly reduced, to a level where fire cannot exist. However, living organisms remain unharmed, because of the gas. Because of such a system, all the delicate or critical items remain untouched and unharmed by fire or water. 2) The Local Application Principle : The Gas Suppression System is directly applied to the fire, immediately on the fire affected area. There are no physical barriers present, as in the case of the total flooding principle. 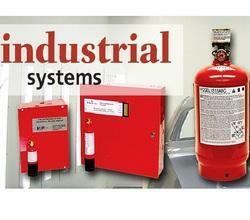 Looking for Gas Detection & Suppression System ?